August’s goals1. Apply what I learned from Code Academy into a website project. August is flying by just as fast as the other months. It’s my birthday month, so you’d think it’d give me some leniency. Nope. I’ve been house-sitting for my parents and my brother, plus I went to Otakon (an anime convention). It’s been a bit crazy 🙂 But I haven’t fallen completely down on the job. 1. Okay, this hasn’t gotten any work done. See above craziness. I have a feeling this is going to fall by the wayside, because writing and editing are more important right now. 2. Yep. I didn’t keep exact track, but I’m pretty sure I’ve hit this mark already. Woo! The story I’m working on is slow going and kind of mellow, but I’m hoping once the drama starts, then the pace will fly by. 3. I sent HtPD to a beta reader and got some positive feedback, so I want to move forward with it. I’m not sure I can get the longer word count I need to make it into something, and it’s too short even for most anthologies, although I think they might let it slide for that. I just sent it to another reader and will await her verdict to see if I can squeeze a few thousand or more words out of this sucker. So that’s that. While I didn’t set many goals for this month, I’ve been doing plenty off-screen (generally editing, writing, and scrounging up submissions for HtPD…and taking care of various households). 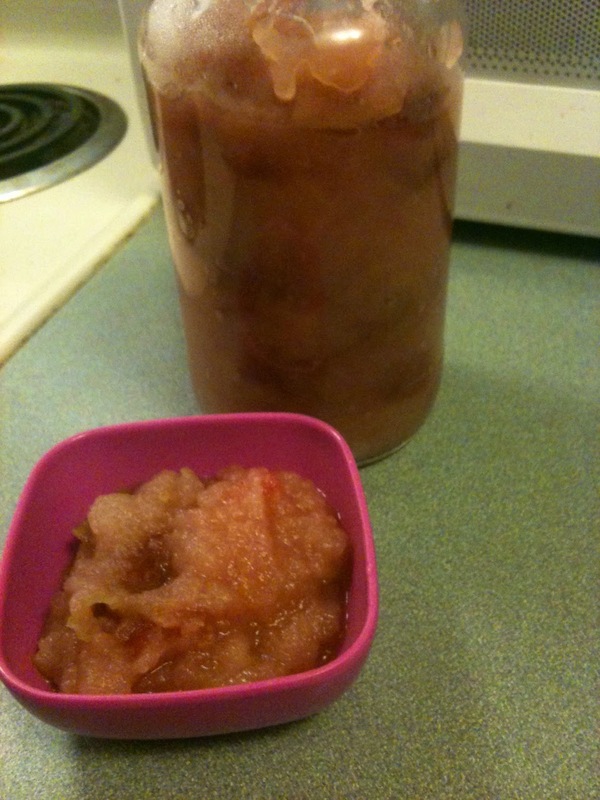 And because I just finished cooking it, here’s some homemade applesauce (I leave the peels on for…health reasons. Yeah, not because I’m super lazy).